Do you find yourself getting the question, “What exactly is cloud storage?” Today, let’s breakdown what cloud storage is. According to an article on IBM Cloud, storage software is predicted to overtake storage hardware by 2020, by which time it will have to manage 40 zettabytes (40 sextillion bytes) of data. From these stats, you can clearly see that cloud storage is definitely in your future if not already part of your day to day now. First, IBM points out that “cloud storage enables applications to upload data to a network of remote, connected servers. Applications can then maintain that data and access it from anywhere.” There are a few varieties of cloud storage. There is personal cloud storage, which many may be familiar with. Personal storage services allow any individual the ability to store and sync data across multiple locations and devices. At the enterprise and business level, the three break outs for cloud storage are public, private and hybrid. When choosing public cloud storage, you are working with a provider who manages the storage completely offsite. Private cloud storage is on-site/on-premise storage within your data center. Finally, hybrid cloud storage is a mix of both public and private features. Finally, if you are are new to the cloud, first identify low hanging fruit or non-critical data that you could test in a cloud environment to gain experience not only with the cloud itself but also with how the cloud integrates with your company’s systems and processes. We also invite you to contact us with your cloud questions and you can also check out our cloud webinars for helpful information on trends and cloud options. Did you know that more than 80% of enterprises embarked on a hybrid cloud strategy in 2015? That is true according to a Rightscale survey reports Steve Uniack for IBM’s Thoughts on Cloud blog. This also took place in a world with ever-growing data – much of it unstructured – creating new demands on storage. So how do you now adjust your cloud storage strategy as your company’s data grows? Cloud storage has the ability to offer your company more agility to move, plan and react to changing data demands but it first starts with developing a solid strategy. Data protection has become a core part of IT, but as a small or mid-sized company you may not have the in-house expertise (or the budget!) to stay on top of the latest and greatest. Also as our computing environments become more and more complicated, data begins to fragment, and it can easily become unclear which data is backed up and recoverable and which is not. And finally, $50,000 to $5 million is the range in dollar losses experienced by companies due to a data loss incident. The numbers are telling but there is a way forward for any-sized business to gain the data protection they need. The cloud offers an opportunity to gain access to affordable yet powerful data backup and recovery. Cloud SAFE backup solutions can offer the protection your business needs with less complication and even less cost. 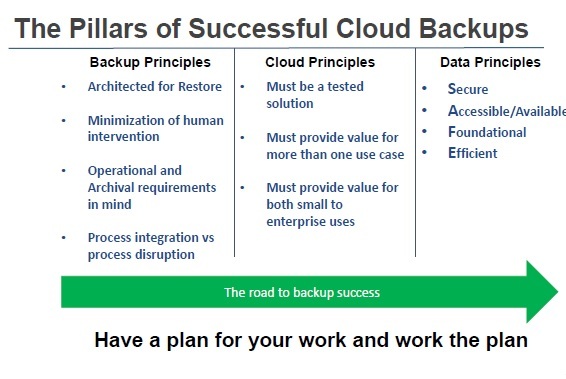 If you would like to learn more, we invite you to attend our SAFE Backups in the Cloud seminar on March 24th at 6:30 pm in St. Louis Park. Learn more about backups in the cloud and watch the premiere of Batman v. Superman before opening night! As many Minnesotans know the weather is a regular topic of conversation around home and around the water cooler at work. Today let’s look at how cloud and big data are impacting weather forecasting. Cloud can provide agility and speed and data can provide power to make better decisions. Cloud solutions are not one-size-fits-all so its important to understand your needs and consider what options and solutions will work best for you business. One of the things I have found most striking having moved from being a customer of IT technology to an architect involved in the selling of IT technology is how often on the customer side of the fence, new and intriguing technology is overlooked due to the reality of operations and needing to keep things running. I am not talking about bleeding edge or strange niche use case technologies, but rather the mainstream software, hardware and services that many customers want and need, but due to time constraints, are not fully investigated until something big happens (read outage, data loss, change in business goals). Knowing this, I have decided to create a three part series that showcases some best examples of this type of technology. For part 1, we will look at technology that has a physical component (something that needs to be installed into a location) so this won’t be cloud only or software only items for this edition of the showcase. AltaVault is a physical or virtual appliance that allows one to utilize cloud object based storage for archival and backup purposes. All while providing encryption and deduplication benefits. Steelfusion is a device that allows one to control all storage from the centeral data center and allows one to “project” LUNS to remote offices for LAN speed performance all while reducing the infrastructure investment at the branch office. As always if you want to know more information on either of these products feel free to contact Evolving Solutions. Files, Collaboration and Sharing – Oh My! Yes, it seems the pitfalls of Dropbox real or imagined are now the unifying thread of the cloud legends of 2015. So, knowing this I started to look into the issues that lead to the above sentence being real, why does data end up on Dropbox? The answer is file sharing and collaboration services in most cases are burdensome, designed for a 20Th century workplace, not the workplace of today. Further, the complications are not only to end users but to the administrators of the systems (storage, servers, security etc). All of this burden is why when time is critical and something needs to get to someone now, Dropbox like it or not is there. Why? From an end user perspective it works, simply and without all the hassles of traditional IT driven file sharing services. When under the pressures of time or money, often convenience wins out over security or data protection. Auditable and traceable reports of access to files. What this looks like in practice even in small companies is a mix of shared storage, SharePoint repositories and local storage on each user’s desktop or laptop. The problem is the practice doesn’t meet all the needs of the above list in a simple to use manner. Some files are on SharePoint so they have revision control, the shared storage (home drives, department shares) may be secure and backed up, but are not easily accessible by outside sources when required. The local storage may or may not be backed up and who knows what level of revision control is happening there. Take this up to the enterprise level and this often involves a complex web of expensive Network Attached Storage (NAS), local storage and Active Directory controls all connected to replicated or backup storage and tapes. What all of this complex jumble leads to is data ending up on Dropbox at some point. So, what if a business could eliminate all of the complexity, uncertainty and meet the above requirements list without investing in expensive software and storage arrays? Would it be worth $7 to $15 per user per month to avoid the entire scenario above and more importantly keep company data under control and be able to audit and know when, who and how users access the data. Complete version and revision control, ability to get to the data on multiple devices, but also the ability to control access based upon the role of a user? If you would like to learn more about the solution I am writing about, it is a good time to call Evolving Solutions. We can go through file/collaboration services that are designed for the 21st century and remove all of the cumbersome storage and server administration from the equation and allows your users to do what they should be doing, getting work done.